After the exhausting lead up to the holiday, spending a week in Siwa, and Albabenshal Inn in particular, was paradise. Siwa is the only remaining spot in Egypt where people are Berbers and speak the Amazigh ancestral language. We arrived at Albabenshal late in the afternoon after an longish journey from Cairo with some fun and games haggling a ride - the buying poer of five meant we arrive in relative comfort in our own van as the bus was full. It was such a relaxed atmosphere; we were welcomed with complimentary drinks. 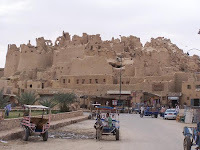 The hotel sits in the centre of Siwa Oasis, built into the mountain fortress. Each and every room is large and cool, on different levels. The dining experience is fantastic and the best part of staying here. We ate our meals on the roof terrace, what could be nicer in the company of friends overlooking Siwa fortress with the fire burning? The food came in generous helpings and was delicious. The waiters could not do enough to please us. Though I did request breakfast at 7am to which one replied 'Uh ah, 7am comes much too early!' The chicken, pita, olives, roasted vegetables, dips, soups, salads, deserts! jams, cheeses, etc. It is all heavenly. Ever heard of olive jam or pomegranate sauce? We set off on bikes for Cleopatra's Pool; a bubbling clear water spring. Juices and swimming were welcome when we finally got there but getting lost was all part of the adventure. Views over the oasis showed us the huge expanse of turquoise waters, no wonder so many made this a destination to conquer. Enjoying chocolate turkish coffee on the streetside was really good with great hilarity watching the donkey eating the cabbages, followed by the chickens having their share and the pigeons getting on the act too. Setting off on our two day safari - our man Nassa reserved in the beginning - well who wouldn't be..became our latest best friend within hours. Despite being told to dress up due to the culture, he swam in his boxers in the hot pool and did not seem to least bit thrown by our heathenly Western ways. The Great Sand Sea is an endless expanse of sand dunes, covering some 70,000 square kilometres, a phenomenal grandeur of Sahara that continues well into Libya. It is a living desert as the dunes move, some of them tens of kilometres long, propelled by the wind, advancing as much as several dozen metres a year. In the middle of the desert we enjoyed lunch by a salty lake and swam in two springs in an area known as Beer Wahed: a hot one and a cold one. The hot spring is contained in a small pool, with bubbling natural hot water. The cold spring was a lovely big pond of fresh cold water. Nassar was an expert at desert driving. The dunes in the Desert are massive in some places, and getting across them in the LandCruiser meant descending some of them, at times exceeding a sixty percent grade, so it felt like a roller coaster drop. Some of us enjoyed that feeling more than others! Sand boarding was a hoot especially watching each others demise. In the Great Sand Sea we found that part of the Mediterranean Sea had flowed over this land many years ago, and lots of shells and fossilised coral remained in the sand. There was a feeling of complete isolation here and sleeping under the stars was totally enjoyable feeling - just me the gentle snoring and the grit. I shall cherish the moment forever. The trip to the desert including the skulls and bones, shells with chalky remains and the petrofied date palm plantation- some of the most amazing things I've ever seen. Thanks to Jo, she was the star who organised the trip and kept us entertained.